We believe in our boats because they are designed and built by hand to the highest standard. We know they are safe, secure, and sea-worthy. But, we still want to share how important it is for you and others on your boat, to be as safe as possible when you are on the water. To reinforce that idea, we thought we would share a few things we know about safety to keep you folks safe and secure. Wear a life jacket. Always assume your boat is going to turn over, that everything’s going to get wet and that everything that can sink will sink. Since that is the case, make sure you have everything safely secured before you start out on your voyage to prevent the worst possible situation from happening. When we go out, we leave our wallets under the seat of the car, and most of the time we do the same with our cell phones. This is more important than focusing on your material belongings, ALWAYS have non-swimmers or marginal swimmers securely wearing properly fitted life-jackets. The same applies to all children. ALWAYS have them wear a properly fitted life-jacket, (PFDs, personal flotation devices.) Little floaties or inner-tubes or water play toys are absolutely not acceptable. Assume you and everyone else are going into the water and that you’ll need to get back to shore on your own power. 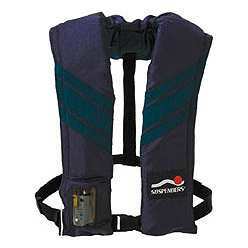 That life-vest you left in the garage or in the car or on the floorboards of the boat ….don’t you wish you had it now? 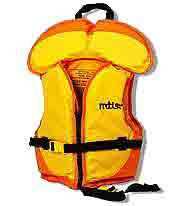 For kids always go with the full life-jacket….such as the one shown to the left. Swim-capable adults might like either of these next two PFDs. They are unobtrusive but will do the job. They inflate either automatically (with a CO2 cylinder) or by pulling on a rip-cord. This is called a Stearns Inflata-Belt. It’s available lots of places online. And this one is called SoSpenders. Also available thru an online search; it also inflates and like the one above, and it won’t get in the way while rowing. As often as we’ve talked about the sea-worthiness of our boats, nearly 100% of the time, when there is a boating incident, in whatever kind of boat, it’s operator error. From the canoe with eight drunks to the Titanic, it’s always operator error. It’s somebody taking a boat into waters unsuitable for that particular boat or that particular day; or it’s the weather changing; or it’s someone loading a boat in an unsafe manner; or it’s too many people in the boat; or it’s alcohol; or a river changing from slow float to something out of Deliverance. We suggest the first time you go out in your boat that you do it solo. Make friends with the boat. Learn how to row it, learn how it feels and responds. Then go back for a passenger; or, perhaps let your passenger take the boat out solo too. Then both of you go out together. (Remember, if there are two adults in the boat….the center seat is empty). Always strive to have the boat sitting flat on the water. For whatever combination of kids, adults, dogs, and gear….you still want the boat flat on the water. Sometimes we achieve that through sandbags or 2-liter soda bottles filled with sand. (A woman, by the way, loves being told that she doesn’t weigh enough.) With practice and experience, you can modify these next recommendations, but it’s often a good idea if two people are going out to have the larger person get into the boat first, sit on the floor (not on the seat) somewhat nearer the middle of the boat. Then have the passenger get in and sit at the other end of the boat. Then the first person moves up to their seat. Always strive to have the center of gravity low and near the center of the boat. Getting out should also be the reverse. A larger person sits on the floor, the second person gets out. Each person holds the boat secure for the other. Only one person moves at a time. Standing in a small boat is always risky, even in our Vermont Fishing Dory, be careful, be cautious, assume the boat’s going to tip over. Out in Washington State, it is a law that you have an emergency whistle on board. Every boat shop sells them. They also sell metal hand-mirrors for flashing at someone on shore. Good ideas. Both of them. Secure gear into the boat. Put the things you want to be kept dry in bags that will keep them dry. Baggies are fine for keeping cookies dry….a waterproof bag is better for keeping that camera dry. Be safe, have fun, assume the worst and you’ll probably never have to deal with anything more severe than too many laugh lines.